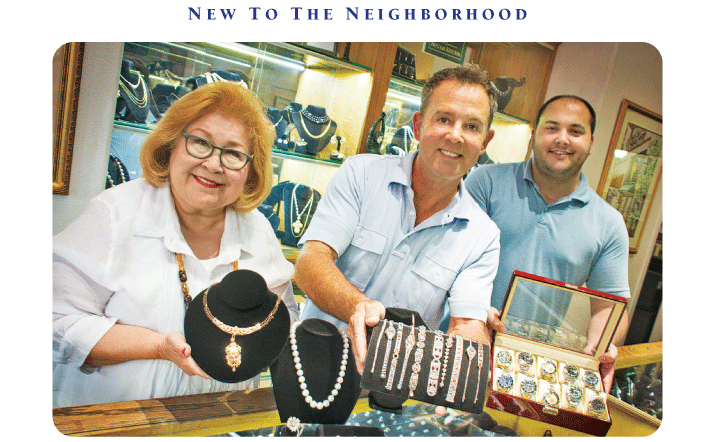 A longtime retailer in Old Towne, William Houchin (center) has added a second location to complement his venerable Watch & Wares Estate Jewelry shop on South Glassell in Old Towne. Opening this November next to Felix Continental Cafe in the Plaza, the new store displays a variety of exquisite jewelry and collectibles. He is pictured here with his associates: Terri Vasquez and John Delsindico. For more than 20 years, William Houchin has maximized every last square inch of his venerable Watch & Wares Estate Jewelry shop on South Glassell in Old Towne. Come this November, the shop, which specializes in the restoration of antique and estate jewelry, will expand its offerings. William is adding a second location in Old Towne just around the corner at 40 Plaza Square next to Starbucks. The new store is about 1,200 square feet and features a customized showroom that displays a variety of merchandise, including artwork, jewelry, coins and collectibles. There will even be high-end vintage purses by Louis Vuitton, Chanel, Hermes and more. As with the original 400-square-foot shop, the same warm, inviting environment will greet customers the moment they walk into the new store. A watch and repair expert, William became interested in watches at an early age when he first saw and became fascinated by his great-grandfather’s pocket watch from the 1800s. He started collecting watches as a child, bringing them home and taking them apart. After serving in the military for four years, William settled down in Orange County, where he set up shop at the old Rocking Chair Emporium before purchasing the small space on South Glassell formerly owned by Dee’s Estate Jewelry. Customizing the new store, William has installed new accents and built the display cases himself. He also hired artist Jake Ledesma to create the same retro graphics and lettering featured at his existing shop.